The first priority for infant feeding is to encourage the use of infant’s mother’s breast milk, but when this is not possible, donated breast milk is the second best option. In developing countries, very few studies have been conducted on the acceptance of donor breast milk. Hence, this study was planned to discover the acceptability of donor breast milk banking, its use for feeding infants, and associated factors among mothers in eastern Ethiopia. A mixed method study was conducted in eastern Ethiopia from December 2015 to February 2016. Data were collected through a pre-tested structured interview based questionnaire. A total of 1085 mothers participated in the survey and six focus group discussions were held with 33 mothers. Descriptive statistics have been used to report results from the survey and qualitative data were analyzed using the thematic data analysis approach. The study revealed that 119 (11%) of participants were willing to donate breast milk for banking and 165 (15.2%) of mothers were willing to use for feeding infants. The acceptance of donor milk banking was 5.8 times more likely among the mothers who had heard about donor milk banking previously (Adjusted Odds Ratio [AOR] 5.8; 95% Confidence Interval [CI] 3.1, 10.72), 4.2 times more likely among the mothers who heard about wet-nurses (AOR 4.2; 95% CI 2.5, 6.99) and 2 times more likely among mothers who had visited a neonatal intensive care unit (AOR 2; 95% CI 1.1, 3.73). Generally, this study showed that the acceptance of breast milk donation for banking and its use for feeding infants was very low, due to lack of information and misconceptions about the safety of breast milk. Therefore, before initiation of any donor milk banking program awareness should be created about donor breast milk and its safety. Human milk banking is the process by which breast milk is collected, screened and pasteurized for the use of hospitals or mothers who cannot breastfeed . The first human milk bank was found in 1909 in Vienna, Austria, and shortly afterwards in Boston, United States of America. Currently, many milk banks have been opened all over the world to minimize infant feeding problems . Human milk is the best source of nutrition for all newborn babies. More specifically, a mother’s breast milk is the first choice of nutrition for those who are preterm, have low birth weight, are unwell  and for those vulnerable infants in the Neonatal Intensive Care Unit (NICU) [2, 4–6]. Pasteurized donor breast milk (PDBM) is not the same as fresh breast milk as it loses certain bioactive and immunological properties [7–9]. The ingredients of human breast milk include immunoglobulins and other active constituents that can reduce infection, necrotizing enterocolitis, cardiovascular risk and metabolic diseases [3, 10, 11]. If a mother’s own breast milk is not available, the second choice should be donor breast milk [4–6, 12]. Many studies have shown that donor breast milk has short and long term benefits as compared to preterm formula [4–6]. This has also been recommended by the World Health Organization (WHO) . Worldwide, 4 million babies die each year in their first four weeks of life. This represents more than 10,000 deaths per day. Most neonatal deaths occur at the very beginning of life; three-quarters of them occurring within one week of birth [13, 14]. The three major causes of neonatal mortality are severe neonatal sepsis (36%), prematurity (28%), and birth asphyxia (23%) [13, 14]. In Ethiopia, the Neonatal Mortality Rate (NMR) has always been very high with an estimated 63% of infant deaths occurring during the first month of life. According to the Ethiopian Demographic and Health Survey (EDHS) of 2011 report, the Neonatal Mortality Rate accounted for 42% of Under-Five Mortality (U5MR) . In spite of many efforts made for the improvement of maternal and child health care services by the government and other stakeholders, the reduction of NMR has remained insignificant. For the years 1991–1995 NMR was reduced from 46 per 1000 live birth to only 42 for 1996–2000, to 39 for 2001–2005, and to 37 for 2006–2011 [14–16]. In Ethiopia, a study conducted in 2007 and 2013 also indicated that prematurity (26.4%), pneumonia (22.6%), neonatal tetanus (9.4%) and sepsis (7.5%) were the leading causes of neonatal mortality [14, 16]. Breastfeeding promotion and the collection of donor breast milk are linked. By offering correct information about breastfeeding, women have an increased chance of successfully breastfeeding their infant . Having a human milk bank in a health facility increases awareness about breastfeeding among families and the community . It is also known that successful breast feeding significantly reduces neonatal mortality and morbidity worldwide [18, 19]. In addition, the availability of donor breast milk is very significant for infants whose mother cannot breastfeed because of medical problems such as maternal open pulmonary tuberculosis, cancer chemotherapy, HIV and other viral infections [1, 3]. To fulfil this need, establishing donor breast milk banking is crucial. In Africa, very few studies have been conducted on the acceptance of breast milk donation for banking and use of donor breast milk for feeding infants [5, 20, 21]. In Ethiopia, no study has been conducted on this topic. Hence, these conditions have prompted us to conduct the study on the acceptance of breast milk banks for feeding infants among mothers who were attending selected public hospitals in eastern Ethiopia. For the purposes of the study, acceptance of breast milk banks was measured by the willingness of mothers to donate breast milk or to use the pasteurized donated breast milk for feeding their infants. A descriptive cross-sectional, mixed method study was conducted. Data were collected through surveys and Focus Group Discussions (FGDs). 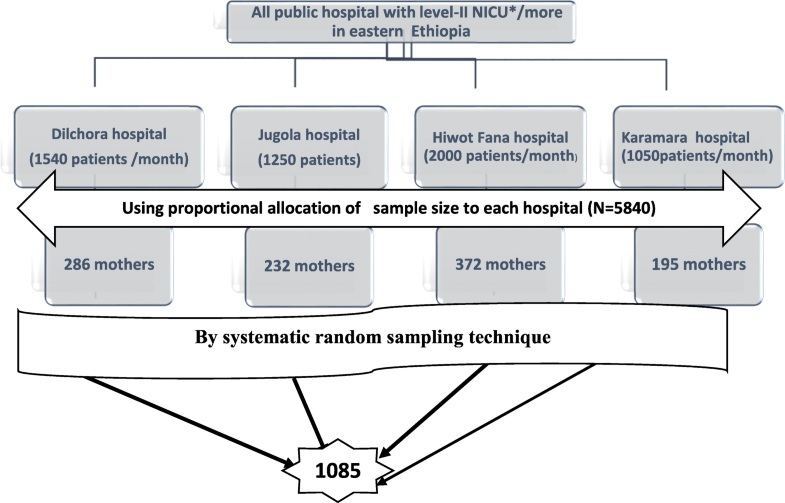 The study was conducted among pregnant and breastfeeding mothers, who were receiving care during the data collection, in Hiwot Fana Specialized University Hospital, Jugola Hospital, Dil-Chora Hospital, and Karamara Hospital, all of which are public hospitals in eastern Ethiopia. The study took place between December 2015 and February 2016. Hiwot Fana Specialized University Hospital, established in 1941provides service for more than 154,196 patients a year and Jugola Hospital, which provides service for more than 90,000 patients a year, are found in Harar. Harar is the capital city of the Harari Regional State and is 517 km away from Addis Ababa. Hiwot Fana Hospital was handed over to Haramaya University in 2010 and since then it has been named as Hiwot Fana Specialized University Hospital [22, 23]. Karamara Hospital is found in Jigjiga City, a capital city of Somali Region and is located 635 km from Addis Ababa, the capital city of Ethiopia. It provides service to more than 90,500 patients per year . Dil-Chora Hospital, which provides service to more than 91, 250 patients per year is located in Dire-Dawa Administrative City, which is 527 km from Addis Ababa . All the breastfeeding and pregnant mothers who were receiving care at the selected public hospitals in eastern Ethiopia during the study period. All breastfeeding and pregnant mothers who were referred from other health facilities to selected hospitals during the study period were included in this study. Critically ill mothers who could not answer survey questions were excluded from the study. One thousand and eighty five breastfeeding and pregnant mothers were involved in the study. The sample size was calculated using a single population proportion formula with 95% confidence level, and 3 % margin of error was used to get the largest sample possible for the survey. The proportion of 59.1% from a study conducted in Nigeria on mother’s attitude towards donated breast milk was used  and a 5 % non-response rate was estimated. A total of six Focus Group Discussions (FGDs) that involved 33 study participants were conducted, and each group consisted of five to seven members. Hiwot Fana Specialized University Hospital, Jugola, Karamara, and Dil-chora Hospitals are the only hospitals that have level two (level-II) or more Neonatal Intensive care Unit (NICU) service in eastern Ethiopia during the study period, and all of them were included in this study. Level-II NICU is also called specialty care and provides services for premature, low birth weight and sick newborn infants . The sample size was allocated to these institutions based on the average number of patients they treat monthly. Finally, the study subjects were selected by using systematic random sampling method, by considering calculated K-value of five (Fig. 1). Data on the socio-demographic characteristics of the participants, maternal health care service use, acceptance of donor breast milk banking, and its use for feeding infants were collected via a pretested, structured interview based questionnaire. For qualitative data, the topics or themes which were used to guide the FGDs were awareness of mothers towards human breast milk banking, importance of human breast milk banking and acceptability of human breast milk donation for banking and the use of donated breast milk for feeding infants. The length of time for each group discussion was determined by point of saturation and the maximum length was two hours. Each group discussion began with the explanation of the purpose of the study and obtaining informed voluntary consent from the participants. The discussion was structured as beginning (getting people talking, relating experiences and ideas), middle (helping people to focus by asking them more specific questions on the topics) and ending or completing group task. An MSc nurse who was trained for this purpose directed the discussions while the principal investigator was tape recording and taking notes. After we had reviewed similar studies, the structured interview-based questionnaire was developed. The tool was first prepared in English and then translated into the local languages (Afan Oromo, Amharic and Somali) for an interview purpose, and finally it was translated back into English for the data analysis. The questionnaire was pretested on 5 % of the total sample size at a different area from the actual data collection site. The data were collected by eight BSC nurses who were given a two-day intensive training course on the content of data collection tools, objectives and how to interview the study subjects. The collected data were checked for completeness each day and any possible errors were returned to the data collectors for correction. For qualitative data collection, the research team reviewed the guiding questions for face validity. They were pilot-tested with two individuals and modified based on these pilot discussions to create the final version. The moderator was trained on the topics or themes which guided the discussions. All discussions were conducted in the local languages (Oromiffa, Amharic, and Somali). During discussion, the chairs were arranged in a U-shape, with every participant visible to each other and to the moderator behind who was tape recording and the principal investigator who was note taking. Data obtained from the survey were checked for completeness, coded and entered into EPI-Info7 and imported into SPSS Version 20 for analysis. They were cleaned and prepared for tabulation. Then, frequency and other descriptive statistics (graphs, charts, proportion, mean and standard deviation) were conducted. The acceptance of donor breast milk among the participants was computed from two variables: Mothers’ willingness to donate breast milk for banking and /or mothers’ willingness to use donated breast milk for infant feeding. A mother was considered as accepting of donor milk banking if she was willing to donate breast milk for banking and /or she was willing to feed donor breast milk to her infant. Any mother who selected both (willingness to donate breast milk for banking and willingness to use donor milk for feeding infant) was counted once. Bivariate analysis was conducted to examine the association between dependent and independent variables; Crude Odds Ratios (COR) and their 95% CI, were calculated. Then, all the variables which have p-value less than 0.2 in the bivariate analysis were included in the multivariate binary logistic regression model to identify explanatory variables that were associated with the acceptance of donor milk banking. Adjusted Odds Ratios (AOR) were computed with 95% Confidence Intervals (CI) and p-value of less than 0.05 was considered to identify significant association. The data obtained from the FDGs were first transcribed and then translated into English language by replaying the record. Finally, they were analyzed using thematic approach by organizing the same concept raised at the discussions. Acceptance of breast milk donation for banking. Acceptance of using donated milk for feeding infants. Socio-demographic characteristics of the mothers. Health care service use of the mothers. Awareness of the mothers about human breast milk banking. Refers to a service which collects, screens, processes, and dispenses donor breast milk to hospitals or recipients. Refers to a mother’s willingness to donate breast milk for banking. Refers to a mother’s willingness to use pasteurized donated breast milk for feeding her infant. A mother was considered to accept donor breast milk banking if she had willingness to donate breast milk for banking and/or she had willingness to use donor breast milk for feeding her infant. A mother was considered to be aware about donor breast milk banking if she had ever heard about donor milk banking. Refers to the act of the lactating mother to give breast milk for human milk banking. Refers to a mother who breast feeds for another’s baby. Of the 1085 mothers who were surveyed at the four selected hospitals, the mean age was 27.7 years ± SD 4.7, 68.8% lived in urban areas, 90.7% were between 18 to 34 years old, 95.6% were married and 75.2% were literate (Table 1). The mothers were interviewed about their health care service use for their last pregnancy and maternal characteristics. More than half (54.7%) of the mothers had visited a Maternal and Child Health Care unit (MCH). With regards to number of pregnancies and live births, 71.7% of the mothers had 1–3 gravida and 76.2% of them had 1–3 parity. Looking at utilization of maternal health care services, 83.1% of the mothers had had at least one antenatal visit and 84.2% of them had given birth at a health facility. Among the mothers who visited an Antenatal care unit (ANC), about 62.9% of them were counseled on breastfeeding. Of the total participants who received postnatal care (PNC) after the last pregnancy, the majority, 92.9% of them were counseled on breastfeeding and more than three quarters (76.7%) of the mothers were currently breastfeeding (Table 2). Concerning awareness of mothers about human breast milk banking (HBMB), 22.3% of mothers had heard about wet nurses but only 10% of mothers had ever heard about HBMB and 5.6% of mothers stated that collecting and storing human breast milk is useful (Table 3). With regards to accepting breast milk donation or banking and willingness to use donated milk for feeding infants, only 119 (11%) of the participants were willing to donate breast milk for banking and 165 (15.2%) of mothers were willing to feed donated breast milk to their infant. About 181 (16.7%) of the participants accepted donor human breast milk banking (Fig. 2). With regard to reasons for being willing to donate breast milk for banking and its use for infant feeding, about 35% of mothers said that formula milk is expensive, 21% of them reasoned that human breast milk prevents diseases, and 28.3% of the participants stated that they had excessive breast milk (Fig. 3). The finding from FGDS also showed that there were supporting ideas to donate breast milk and use it for infant feeding. According to the participants who were willing to donate breast milk for banking; it was stated that donated milk is good for babies who cannot get their own mothers’ breast milk. Reasons given in interviews for being unwilling to donate breast milk for banking or to use it for infant feeding included fear of disease transmission (68.6%), fear of unhygienic milk collection (43.9%) and religious issues (19.1%) (Table 4). The finding from FGDs also showed that reasons for being unwilling to use donor breast milk for feeding infants were also due to fear of disease transmission, safety of donated breast milk, and religion. A 23-year-old mother stated that, “I fear the transmission of different diseases from the use of donated human breast milk for infant feeding. Especially diseases such as HIV can be transmitted to baby through donated breast milk.” On this issue a 21-year-old mother explained, “It is not good to feed someone else’s breast milk to my baby because there are some diseases such as cancer and acne [Golfaa and Finnisa] that can be transmitted to baby through breast milk.” Another mother stated that, “It is not acceptable to use someone else’s breast milk for infant feeding because it is not good and the milk may expire. I do not like to donate my breast milk for other infants, because I do not think that my breast milk is good for other babies.” (21-year-old mother). In this study, the factors associated with the acceptance of breast milk banking were also assessed. The use of health care services, NICU visit (AOR 2; 95% CI 1.1, 3.73) and number of antenatal visits during pregnancy (AOR 0.52; 95% CI 0.32, 0.83) were associated with the acceptance of human milk banking. Acceptance of human milk banking was over 5 times more likely among mothers who had ever heard about human breast milk banking (AOR 5.8; 95% CI 3.1, 10.72) compared to those who had not heard about it, and it was 4.2 times more likely among mothers who had heard about wet-nurses (AOR 4.2; 95% CI 2.5, 6.99) compared to those who had not heard about them (Table 5). FGD data also indicated that mothers who had their newborn baby admitted to a Neonatal Intensive Care Unit supported breast milk donation and its use for infant feeding. Some mothers also stated that it is good to donate breast milk for babies who will not receive their own mothers’ breast milk. The current study sought to determine the willingness of mothers to donate their breast milk for breast milk banking and their acceptance of its use for infants feeding. The survey showed that among total study participants only 119 (11%) were willing to donate breast milk for banking. This percentage is less than the study report from Nigeria, which showed that 39.9% of the study subjects accepted breast milk donation . The difference might be due to the fact that in Nigeria the service has already started and this might have increased the awareness of the mothers, unlike most of the participants in our study (90%) who said they had no information about human milk banking or donor breast milk feeding for infants. In this study, only 15% of the mothers agreed to use donated breast milk for infant feeding, and this is comparable with a report from Nigeria . Like similar studies in Nigeria and South Africa, the primary reasons for their unwillingness to donate breast milk for banking or to use it for feeding infants were safety and fear of disease transmission [20, 21]. FGDs also showed that the majority of participants stated they have had received no information about human milk banking or donor breast milk feeding for infants. Some of the participants in the FGDs mentioned that different diseases can be transmitted to infants through donor breast milk. Particularly, diseases such as cancer, acne and HIV can be transmitted. From this we understand that before the initiation of donor breast milk banking service, it is necessary to consider safety matters during the process of donation, preservation, dispensing and use of donor breast milk; and create awareness about the safety of donor breast milk among the donors and recipients. Findings from FGDs showed that the religious issue was one of the reasons for the unwillingness to donate breast milk for banking and to accept its use for infant feeding. The study participants mentioned that it was not right to feed another mother’s breast milk for infants feeding rather it is better to feed formula or cow milk by bottle as an alternative. Some of the women also mentioned that the use of another mother’s breast milk for the infants feeding can only be possible if recipient’s baby has a blood relationship with the donor. This information may be related to the religious belief that the person who donates breast milk for a baby is considered as maternally related to the baby. Therefore, the infant would be considered as the donor’s child and marriage between the recipient’s and donor’s offspring is forbidden, as was mentioned in a paper on the introduction of donor milk banking in a Muslim country . Although the majority of the participants did not support the idea of breast milk donation for banking and were not willing to use it for infant feeding, some women appreciated the advantages for mothers who could not breastfeed and the benefits for babies. The breast milk provides the best nutrition for infants especially during their first six months of life. The World Health Organization (WHO) strongly recommends that for infants who cannot receive their own mother’s breast milk, the preferred option should be donor breast milk . The study showed that there are factors that can be used to increase willingness to use human breast milk banking. It was found that awareness about donor breast milk banking and wet-nurses were significantly associated with acceptance of donor milk banking. It may be that as mothers receive information related to human breast milk banking and use of someone else’s breast milk for infant feeding, their acceptance of donor breast milk increases. The study conducted by Meneses et al. in Brazil in 2013 also showed that information about breast milk expression was significantly associated with human milk donation for primary health care (Adjusted Prevalence Ratio 3.6; 95% CI 1.48, 8.97) . Other factors which showed significant association with the acceptance of donor breast milk banking were the mothers’ NICU and antenatal care visits and maternal counseling about breastfeeding. This finding contradicts a study conducted in Brazil which showed a 90% reduction of breast milk donation among the participants who admitted their newborn infant to neonatal intensive care unit . This might be related to maternal exposure to actual breast milk donation because in the case of the previous study those mothers might face negative effects of preterm birth that limit their milk donation tendency, whereas in the current study mothers were not exposed to actual milk donation rather they were only asked about their future willingness to donate. The limitations of this study are that the views of health professionals and policy makers were not collected, as they are the immediate stakeholders for the implementation of human milk banking service. In conclusion, this study showed that the acceptance of breast milk donation for banking and its use for feeding infants was very low, due to lack of information and misconceptions about the safety of breast milk, along with religious reservations. Therefore, before the initiation of donor milk banking services, a program should be designed to create awareness about donor milk banking among donors and recipients. We would like to express our deepest gratitude to Haramaya University research and community services office for giving us this valuable opportunity. We would also like to express our thanks to the institutional health research Ethical Review committee at Haramaya University, College of Health and Medical Sciences for their indispensable comments on this study. We are also grateful to the study participants, data collectors, and site supervisors for their full contribution. We would also like to thank Mr. Asfechaw Belcha and Dr. Nicole Mohajer for language editing. This study was funded by Haramaya University Young Innovative Research Grant Funding, reference number for this grant: HURG-2015-02-03. The funding organization has no role in the designing of the study, data collection, analysis and its interpretation, protocol writing and submission. TFG, the principal investigator, generated ideas to start Human Milk Banking (HMB) services in Eastern Ethiopia at Hiwot Fana Specialized University Hospital in collaboration with Haramaya University Community Services Office. He wrote the initial draft of the proposal and supervised the implementation of the study, worked on designing the study, data collection, processing and analysis and manuscript writing. YDB (PhD, MPH, BSc), NA (PhD, MPH, BSc), AM (MPH, BSc), AAR (MSc, BSc), YA (MSc, BSc) and FT (MD, MSc) participated in designing the study, data collection, processing and analysis and manuscript writing. All authors critically revised, read and approved the final manuscript. Ethical approval for the this study was granted from Haramaya University, College of Health and Medical Sciences, Institutional Health Research Ethics Review Committee (IHRERC) (Ref.No.IHRERC/29/10/2015), November/03/2015. A formal letter from the college of Health and Medical sciences was submitted to all concerned bodies in the study area to get their co-operation in facilitating the study. All the participants were asked for voluntary informed consent for participation before the interviews. World Data Bank: World development indicators. The World Bank Group; 2013. http://www.worldbank.org/en/country/ethiopia. Harari Health Bureau. Harari Region Ethiopia [Internet]. hospital by. Available from: http://www.hospitalby.com/ethiopia-hospital/harar-hospital/ Accessed 3 Oct 2015. Dil-Chora Hospital. http://placesmap.net/ET/Dil-Chora-Referral-Hospital-1343/ Accessed 3 Oct 2015.